A cornerstone of the Save Texas History™ mission is map and document preservation and conservation so generations of Texans may continue to benefit from our rich historical resources. Conservation is a detail oriented, time-intensive, and expensive task necessary to preserve Land Office holdings. Teaming with private contractors, we examine, document, treat and conserve the physical objects found within our archives. During examination, trained archivists and preservation professionals assess the condition and materials of any given item. Conservators then perform treatments that prevent further deterioration or to improve the condition of the items. Conservation includes dirt removal, deacidification, mending, flattening and meticulous repair. Conserved documents are scanned at high resolution, posted online and used to produce high quality color prints for purchase. Tens-of-thousands of documents have been conserved but many others continue to age and are in need because of continuous use and poor early storage conditions. 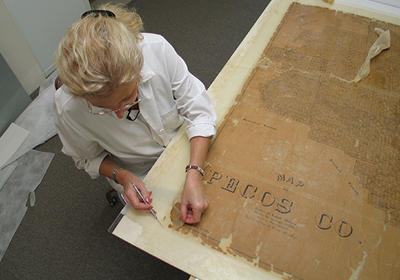 Conservation efforts are funded solely by grants, private donations and photocopy and map reproduction sales. No state money is appropriated for document preservation.